At Gold Medal Gyms our Friday Night Out is a supervised open gym, every third Friday of the month from 6:00 p.m. to 10:00 p.m. However, we do not offer Friday Night Out during times when the gym is closed for holidays. Boys & Girls ages 5 and up are welcome. The price is only $17.00 plus tax, per child and we provide fun, pizza, snack and a drink. So if your looking for an evening out and don’t know what to do with the children, have them join us on every 3rd Friday of the month. Gold Medal Gyms Friday Night Out allows parents to drop their children off from 6:00 pm to 10:00 pm and let them get out all their energy, then take them home tired for bed. Don’t worry about paying a babysitter, this has a better upside…you go home to a clean house! Children will enjoy an evening of fun, safe activities while giving their parents a night of freedom! Parents, go out and spend a night on the town while your kids have a blast at Gold Medal Gyms! Friday Night Out is a fun and safe filled evening with supervision for the kids. 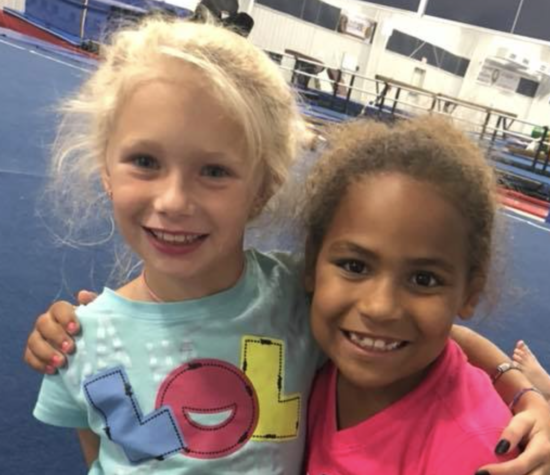 They will play games and enjoy all the different activities a Gymnastic facility has to offer. Gold Medal Gyms provides fun, pizza, a snack, and a beverage for every child for only $17.00 plus tax. So parents plan your next night out by sending your child to Gold Medal Gyms Friday Night Out.